Crappies are widely popular for southern anglers during those first warm days in March. After all, 50°F water means biting crappies that any angler worth his salt can catch. Yet, crappies aren't the only panfish eager to nail a jig in 50°F water. Bull bluegills are often shallower and easier to catch. In a few months when bluegills are on the beds, everyone has their sights set on them. But if you'd rather not wait until the spawn, you can catch prespawn bluegills now without much competition from other anglers. If trophy hump-head bulls interest you, early spring is your time. Bluegills are easy to find most of the year. Even big ones are a few links down on the food chain in most waters, so they're rarely caught far from the security of some type of cover. When the sun begins warming the shallows in early spring, they capitalize on mid-depth cover. Depths and types of cover vary from lake to lake. In a highland reservoir it might be a rockpile or emergent weeds on the edge of a secondary creek channel in 8 feet of water; in a shallow oxbow lake it may be cypress knees in 4 feet of water—but more on cover specifics later. Although cover provides security, that's certainly not all bluegills are after. "In Arkansas oxbows, when the water temperature hits 52°F to 53°F, bluegills quickly move in from wintering areas, stopping at the first shallow cover they come to," says Brandon Gavrock, a wildlife officer with the Arkansas Game and Fish Commission in Crittenden County. Gavrock has been fishing oxbow lakes in the Mississippi River Delta since he was a kid. "A bluegill is scared of being eaten by something, so by its nature, it hangs tight to cover. But more importantly for fishermen, at that time of year, they're moving into the shallower cover to feed." Tiny baitfish and invertebrates are abundant in the thick stuff once the water begins to warm. "Around here, when the water hits 50°F to 52°F for a week, it often brings on the first insect hatch," says Louie Mansfield, a former guide on Tennessee's Reelfoot Lake and owner of Grizzly Jig Company. "Lake flies hatch in the water, float to the surface, and wiggle out of their shells. They collect along standing trees and grasslines at that time of year, and they draw in a lot of bluegills." Different types of cover serve as suitable staging areas, depending on the fishery. On Kentucky and Barkley lakes, two highland reservoirs known for crappie and bass fishing, but rapidly gaining fame as bluegill and redear fisheries, offshore rockpiles and emergent weeds are great places to check, especially if they're within an easy swim of a good spawning area. One of my favorite areas on Lake Barkley is within 20 yards of a community wintertime crappie hole. It's a flat just off a secondary creek channel with a large amount of sunken brush. Bluegills are usually scattered within the brush, but they're reliably stacked on a large rockpile on the edge of the channel. In May, the fish bed along the shore within two long casts of that rockpile, and it's a popular spot for bank fishermen. But bluegills are virtually ignored in the area the rest of the year. Fishing for them over that rockpile on even the most brisk of early spring days has always been as reliable for me as when they're on their shallow nests. On mud- and sand-bottom oxbow lakes, woodcover takes top shelf because weeds and rocks usually aren't as common there. One of my favorite Arkansas oxbows is disconnected from the Mississippi River, and it endured a prolonged drought a few years ago that allowed the shorelines to become covered with willows. Once the lake returned to its normal level, the outside willows were flooded. The deepest of them are now in 5 to 6 feet of water—perfect habitat for early spring bluegills. Other types of cover also are worth checking. "Man-made cover, such as boat houses and piers, can concentrate bluegills during the early spring," Gavrock says. "I like to fish older, established piers because they're usually the first to grow algae when the water begins to warm. That algae concentrates little baitfish, and those baitfish attract big bluegills and other gamefish." Beyond cover, water temperature is the most important consideration at this time of year. Bluegills are especially choosy in this regard, and a couple degrees can make an amazing difference. Last spring, for example, while fishing an oxbow lake in Arkansas, I found numbers of fish that were easy to catch among cypress knees, where the water was 54°F. Trouble was, the wind was pounding me on that side of the lake, making it difficult to keep my boat where it needed to be. I motored into calmer water and fished cypress trees in an identical water depth. The water temperature there was 52°F. I never got a bite—two degrees was the difference in hungry fish and the Dead Sea. 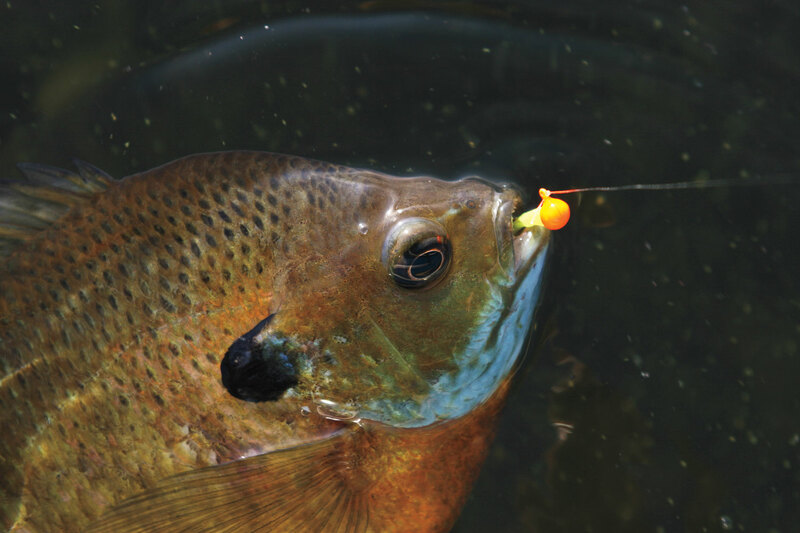 Areas where numbers of early spring bluegills congregate can be on two ends of the spectrum when it comes to fishing style. An offshore rockpile in 8 feet of water is a "spot-on-a-spot" area. If your presentation is just a few feet away from the cover, you probably won't get a bite. Casting a slipbobber rig can work, but it doesn't take your rig long to drift out of the strike zone with even a light breeze. At the same time, a mile of flooded trees in an oxbow lake can present a bewildering amount of cover to fish. If you spend too much time in one area and fail to get your bait in front of enough different pieces of cover, you're apt to never find the sweet spot. But beyond covering water or fishing a spot within a spot, bluegills in cold water seem to respond best to a bait suspended in front of them and held perfectly still. Fishing vertically with a tiny jig is among the easiest ways to accomplish that. For this, a short ultralight spinning rod works well for offshore, while a long dipping pole is perfect for shallower, visible cover. I've had good luck with painted 1/32-ounce ballhead jigs tipped with waxworms. Jigs with dressing work as well and seem to entice more strikes from crappies that are testing the shallows. "I prefer a hair jig, such as a black Grizzly Jig, for dipping in oxbow lakes," Gavrock says. "I use either a 1/32- or 1/80-ounce size. A 1/80-ounce slows you down because of its rate of fall, so I like a 1/32-ounce jig for searching, and a smaller jig once I've found fish, particularly if they're acting finicky." Northland Gypsi Jigs are among my favorites, but any tiny hair jig works. Grizzly Jigs use duck feathers tied to size #10 fly hooks. They're designed specifically for this style of fishing. They're available in sizes down to 1/80-ounce—Mansfield's favorite. Be prepared for a slow fall when using these tiny jigs over plain ballheads. Carefully control your line to keep it as taut as possible, which is another advantage of fishing vertically. Most strikes occur as the jig is falling, and if your line is slack, you never feel them. Adding something for scent enhancement is usually a good idea. I like waxworms and begin each outing by hooking the worm through the middle, allowing it to wiggle ever-so-slightly in front of the fish's nose. Once I find fish and decipher whether or not they're finicky about biting, I may thread the waxworm onto the hook to save on worms and rebaiting time. A little piece of redworm works too. Mansfield sometimes foregoes livebait altogether, choosing instead to tip his jig with Berkley Powerbait Nibbles, or to spray it with scent. Although any ultralight setup works for dropping a tiny jig over the top of submerged offshore structure, a shorter rod has advantages for control and precision. I like a light ice rod when fishing rockpiles in the early spring on Kentucky and Barkley lakes. It draws a few funny looks from southern anglers, but it seems a natural choice for vertically fishing tiny jigs. Sensitivity is paramount in this situation, so I spool up with something that doesn't stretch. Two-pound-test FireLine Crystal is my favorite. Finding productive offshore areas can be time-consuming in early spring, so casting presentations come into play. For fishing the edges of pea gravel flats, points and emergent grasslines, Kentucky and Barkley lakes guide Jack Canady likes casting a downsized drop-shot rig. "I use a 5½- to 6-foot rod to cast a 1/4-ounce drop-shot weight tied about 18 inches below a #4 Aberdeen hook," he says. "I tie that hook directly to my line, and use a redworm or piece of nightcrawler on it. Six-pound-test fluorocarbon has been the best line for me. Lighter than that and those big shellcrackers can snap it." Canady is focused more on redears than bluegills in the early spring because they're a more popular species among his clients and plentiful in Kentucky Lake. But he catches plenty of bluegills doing this as well. Even though his presentation is a casting one, it involves a lot of stationary time for the bait. "I raise my rod tip a bit, pull the rig toward me a foot or so, then lower my rod tip to give it a little slack," he says. "That method works well for fish that are staging around cover right off those pea gravel flats before the spawn." Long, telescoping jigging poles are sold in about every Mid-South tackle shop for less than the cost of a premium crankbait, and they're ideal for this type of fishing. No reel is required, since dipping takes place in less than 10 feet of water, but using one may simplify things. Mansfield uses a graphite rod in the 10-foot range most of the time, with 4-pound Vicious high-visibility yellow line spooled onto an automatic fly reel. The hi-vis line allows him to see strikes a little easier with a 1/80-ounce jig. I prefer a heavier setup for heavier cover. My two personal favorites include a 10-foot pole with 4-pound monofilament for fishing sparse, isolated cover and the edge of thick cover, and a 13-foot pole with 8-pound FireLine Crystal for reaching back into dense stuff, like flooded willows and cypress knees. Thick woodcover claims a lot of jigs, so the braided line allows you to straighten the hook to free a snagged jig, saving you a few cents and some retying time. You're also better equipped for the occasional channel cat or largemouth. The idea when dipping shallow cover is to keep moving until you find fish, but you still must give them time to react with each drop. "I may only leave a jig next to a piece of cover for a few seconds when the water is warm," Gavrock says, "but it may take a little longer to entice a bite in the cooler water. I usually drop the jig next to the cover, leave it for 10 seconds or so, and move on to the next piece of cover." Although the water may only be 5 or 6 feet deep, most of the fish hold in a similar depth next to the cover. Once Gavrock finds a productive depth, he sometimes clips a float to his line for consistency, even if the float isn't necessarily used as a strike indicator. At the very least, he notes the distance of his rod tip from the water's surface at all times. Once he catches a fish, he tries to duplicate the same presentation for the next dip. When informed anglers think of prespawn fishing, they picture early spring weather in the wake of a long winter, cabin fever relief, and a good chance at trophy-class fish. Early-season bluegill fishing is no different. Like any other type of prespawn fishing, certain techniques seem to have advantages. Dead-sticking a tiny jig around mid-depth cover is always a solid bet.